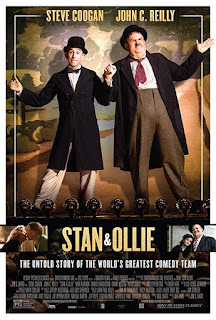 Read Will's review of Stan & Ollie. Laurel and Hardy, the world's most famous comedy duo, attempt to reignite their film careers as they embark on what becomes their swan song - a grueling theatre tour of post-war Britain. A wonderful, heartfelt tribute to the most iconic duo act of all time, Stan & Ollie gets the most out of the excellent chemistry between Steve Coogan and John C. Reilly as it sends the audience on a journey chronicling their ups and downs. Starting at their peak when they were on top of the world. The movie shows them at their last days of touring together and the flashing back, struggling to sell out small theatres. It's incredibly well executed, boasting a wealth of charm and sincerity. I really didn’t know too much about them before this movie outside of the few shows I saw of them on TV growing up. Both Steve Coogan & John C. Reilly are brilliant as Laurel & Hardy. Using their experience and comedic timing to recreate classic sketches splendidly. Much like Rami Malek from last year, you'll genuinely believe that Reilly IS Oliver Hardy. And of course the movie wouldn't work if his dynamic partner, Stan Laurel didn't show up and I'm pleased to say that Steve Coogan also delivers an equally fantastic performance. While their two wives, Lucille and Ida, played by Shirley Henderson and Nina Arianda respectively, offer much needed spice to the film when it begins to descend into just a simply greatest hits compilation. The cinematography is pretty good here and the set design too, is faultless. The movie nails the humor and comedy of both characters. But despite this I wasn't completely wowed by it. It’s charming and delightful but probably isn't going to stay with me anytime soon, hitting too many familiar beats that biopics tend to do, often feeling fairly simplistic in nature. Aside from the really cool opening shot that flashes back to the duo's glory days, director Jon S. Baird largely steps back and helms the movie in an understated way, preferring to use long takes that emphasize the physical routines and the quiet and unsaid moments in their relationship. I did enjoy it more than I was expecting to, but its a fairly average biopic tropes are saved by memorable lead performances. It's inoffensive and takes little risks, but as a love letter to Laurel and Hardy it works perfectly, and it's the perfect film for a lazy afternoon viewing. Perhaps a little lightweight for some but there is emotion here and very little to dislike. It does occasional feel a touch too cheesy but it’s sweet natured and enjoyable throughout. And as a testament to how enjoyable this film was, I did enjoy this enough so that I wasn't too bothered by some of standard biopic clichés.